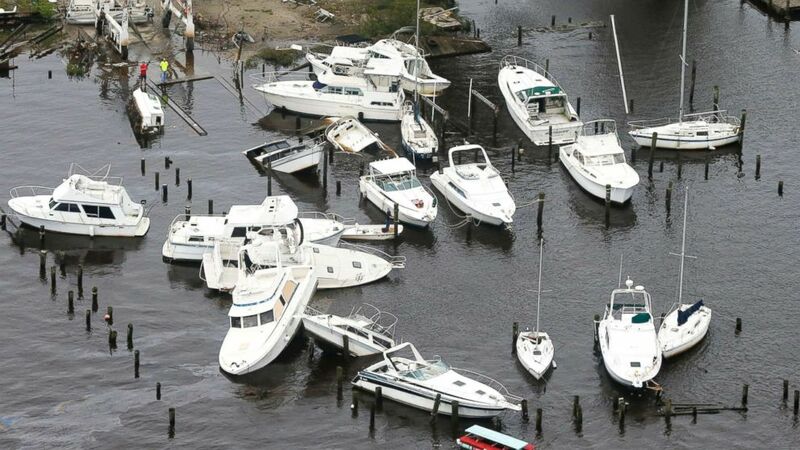 This is a rush transcript for "This Week" on Sunday, Sept. 16, 2018.
camera (Steve Helber/AP) Boats are stacked up on each other in a marina as a result from Florence in New Bern, N.C., Sept. 15, 2018. A rush transcript of “This Week with George Stephanopoulos” airing on Sunday, Sept. 16, 2018 on ABC News is below. This copy may not be in its final form and may be updated. For previous show transcripts, visit the “This Week” transcript archive. JON KARL, HOST: Florence crawls through the Carolinas, in some areas dumping more than two feet of rain. GOV. ROY COOPER, (D) NORTH CAROLINA: The water is rising fast everywhere. KARL: The monster storm causing extensive damage and catastrophic flooding. But is the worst still to come? This morning, an update from the Coast Guard commandant briefing the president and the very latest on the ground in North Carolina. And a stunning about face, President Trump's former campaign chairman has gone state's witness. Paul Manafort has now agreed to cooperate with the special counsel. What will he tell Robert Mueller? We break it all down with White Water independent counsel Ken Starr and Obama ethics czar Norm Eisen. JAMIE DIMON, JP MORGAN CHASE CEO: Because I'm as touh as he is. I'm smarter than he is. KARL: The president is hitting back, calling JP Morgan Chase CEO Jamie Dimon a nervous mess, saying he doesn't have the aptitude or smarts to run for president. But will the Wall Street titan go toe to toe with Trump in 2020? We ask Dimon in our exclusive interview. What's fact, what's fiction and what matters This Week? ANNOUNCER: From ABC News, it's This Week. Here now, chief White House correspondent Jonathan Karl. KARL: Good morning and thank you for joining us this Sunday. After making landfall Friday, Florence is still wreaking havoc in the Carolinas. The slow moving system, now a tropical despression, is causing major flash flooding and record rainfall, leaving homes and major roadways underwater. Parts of North Carolina have been inundated with over 30 inches of rain. Florence has claimed at least 13 lives. The Coast Guard and volunteer teams are carrying out search and rescure missions to save those trapped in their homes. One of the biggest concerns now is rising river levels that could make a bad situation even worse. ABCs Eva Pilgrim has been following this storm and joins us now from Fayetteville, North Carolina. Eva, you are in the island part of the state where Florence will wreck the more havoc in the days ahead, and I understand officials are predicting flooding beyond anything they have ever seen? EVA PILGRIM, ABC NEWS: Well, let me just show you what we are looking at . This is a little river right here. You can see it's moving very quickly. It's also very high, you can tell that when you look at the proximity of it next to this bridge. It's risen about 10 feet in the last 24 hours. Theyve had about about eight to 10 inches of rain in this area. They are expecting to get two more solid days of rain, another eight to 10 inches. And let me just put in ot perspective why this is so concerning. So, the highest it's been before was Hurricane Matthew in 2016. It was about 31 feet. They are predicting that this river will crest much higher than that at about 35 feet. It's off the ruler here. And that puts me squarely under water and it really puts into perspective why they don't want people to be in this area when this river crests, Jon. KARL: We've heard the mayor has ordered a mandatory evacuation this afternoon saying that anybody who doesn't leave should be notifying next of kin. That sounds pretty dire. Are people heeding the warning? PILGRIM: We drove around and looked at these neighborhoods, a lot of people are in their homes. At this point they've got about eight huours to get out. A mile within this river also the Cape Fear River, they have also put a mandatory evacuation order for that area as well. It all goes into effect at 3:00 p.m. today. And the reason for it is when you look at other parts of the state that are already underwater, they're having to do water rescues there. Boats are going in. The Coast Guard even having to go into rescue people with choppers to get them out of those flooded areas. Jon, they don't want that to happen here. And let's bring in the director of North Carolina's emergency management, Michael Sprayberry. Director Sprayberry, you issued an ominous warning yesterday saying that this flooding is only going to get worse. How bad is it? And how bad do you expect it to be? MICHAEL SPRAYBERRY, NORTH CAROLINA DIRECTOR OF EMERGENCY MANAGEMENT: It's bad right now. And we do expect it to get worse over the coming days. We will tell you that we have got over 1,000 search and rescue personnel that are out with over 2000 boats. We have around 36 helicopters that are either in the air or available to us to perform search and rescue operations. We know that's going to be a major mission going forward, because this is historic and unprecedented flooding. KARL: You've witnessed a lot of major storms, a lot of big hurricanes in North Carolina. How does this one compare? SPRAYBERRY: I would tell you that this is one that’s for the record books. We’ve had unprecedented rainfall, as I just said, and flooding. We’ve also had some extreme coastal storm surge that was well predicted by the National Hurricane Center and we had some pretty high winds. I will tell you that the winds ended not -- thankfully not being as high as expected. But we had that triple threat. There’s going to be a lot of damages, I know, to tens of thousands of North Carolinians’ homes, so we -- we have a lot of work cut out for us. SPRAYBERRY: We’re still in the response phase, though, right now. KARL: Yes, I know you’re still in that response phase. There’s still a lot more rain to come, a lot more flooding expected. Do you have an initial assessment of just how bad the damage is and what it is going to take to recover? SPRAYBERRY: I can tell you that we’ve already received an expedited disaster declaration from the federal government. We’re looking to add some more counties to that in the coming days. This will be a long term recovery. As you know, we’re actually still recovering from Hurricane Matthew in October of 2016, so it will be a massive, long term recovery. But as I said, we’re still right in the midst of a very aggressive and large response at this time. And so for people that have been asked to evacuate, we really want them to heed the advice of their local officials and evacuate. KARL: You’re at the State Command Center there in Raleigh. Are you getting everything that you need from the federal government right now? SPRAYBERRY: Absolutely. We have incident management assistance teams, I’ve got a federal coordinating officer with two deputies here. As a matter of fact, we have our region four administrator right here with us. We have a -- a -- a large number of urban search and rescue teams, swift water teams, the Coast Guard, all here from the federal government to assist us. It’s a full team effort. They are integrated into the response. Team North Carolina, one team, one mission. KARL: All right. Thank you, Director Sprayberry. We’ll look forward to talking to you again soon, getting another update. Thank you. And joining me now in Washington is the U.S. Coast Guard Commandant Admiral Karl Schultz. He oversaw the Coast Guard’s responses to Hurricanes Irma, Maria and Harvey last summer and is taking a lead role in the federal response to Florence. Currently there are more than 3,000 Coast Guard members in the disaster zone (ph), some of them taking part in those dramatic helicopter rescues that so far have saved 57 people. Admiral Schultz has also been briefing the president on the latest developments. Admiral Schultz, thank you for joining us here. ADMIRAL KARL SCHULTZ, COMMANDANT, U.S. COAST GUARD: Good morning, Jon. KARL: So when did you last give the president an update and what did you tell him about the situation. SCHULTZ: Well I was involved in a phone briefing to the president yesterday, in person briefing the previous day. We gave him an update, we being Department of Homeland Security partners, secretary of Health and Human Services, other members of the White House team. We talked about the -- the massive, you know, risk the storm poses, catastrophic flooding, prolonged flooding, we gave him an update on response capabilities in the theater. The president is completely leaning in. Anything the feds need to do to support the locals, the state partners here in South Carolina, North Carolina. We feel fully supported. KARL: And we’ve been seeing the dramatic video of those helicopter rescues. 57 people already saved by the Coast Guard. Do you -- are you confident that you have the resources in place to get to all of those that are going to need evacuation in the days ahead? SCHULTZ: Jon, I absolutely feel very confident. We’ve got 28 aircraft in the region, those are rotary wing helicopters, large Jayhawks and smaller Dolphin helicopters, 11 fixed wing. We’re part of a federal team. There’s National Guard, air east resources (ph) available, we’re supporting the states, I’ve got 35 what we call shallow water rescue teams, 25 teams in North Carolina, 10 in South Carolina. They’re part of the team that Michael talked about out of the EOC that are -- that are local, state and feds working together. The partnership’s strong, the dialogue’s good, we’ve got the right connective liaisons in the emergency operation center. So we’re ready to continue to respond to this very challenging situation. KARL: What’s your biggest concern in the days ahead? SCHULTZ: My biggest concern is the rising water. You know, you heard reports of 24 inches of rain in Wilmington today with potentially 15 inches more. The storm is moving very slow. It went from 2:00 to 3:00 (ph) almost stagnant yesterday, eight miles an hour, that’s still slow. It’s southwest of Florence, South Carolina. It’s going to be in the state another, you know, good part of 24 hours before it moves out up through the Ohio Valley. So we’re looking at a high -- high water situation. The rivers potentially crest here into the early part of this week, so we have not seen the worst of the flooding. People need to heed the warnings from their local emergency management experts and -- and stay in safe grounds. And again, this could be a more catastrophic flooding situation before it’s over. So I’m concerned that -- you know, if people make good choices, they -- they stay advised and in tune -- and I can assure you, though, that the -- the local state federal team is ready to continue to respond. KARL: Because as we saw with Harvey, the – the worst came after the storm. SCHULTZ: And every storm, Jon, is different as we’ve seen. This was forecast to be a, you know, category four or five storm, everyone’s thinking about the winds. It downgrades to a category one storm, but it’s persistent. It’s very much in many regards like a Harvey that just sat still and dumped 52 inches of rain down in Houston. Here we’re looking at, you know, feet of rain as well and the water really is what tends to pose the most risk to people. KARL: Before you go, I’ve got to ask you about the president’s comments on Hurricane Maria. You were intimately involved in that effort, Coast Guard did a lot – a lot of good work down in Puerto Rico. But the president called that relief effort a unsung – incredible unsung success. Is that they way you saw it? SCHULTZ: Jon, I will tell you this, every relief, every storm is very different, we’re seeing that play out. I just spoke a little bit about Florence, what was predicted, what was actual. I would say the response in Maria was – was massive in terms of it’s – it’s an island, which makes things (ph) challenged. The – the supplies that were lifted in by sea, by air, I’ve got 600 plus Coast Guard men and women that call Puerto Rico home. They work out of there. We leaned in with every bit of energy we could as a federal agency. I saw my FEMA colleagues, other agencies working hard. You know, the dispute about numbers, those are locally generated numbers. I believe that the Department of Homeland Security welcomes transparency on that. I’m focused on this storm, that’s what’s in our wheelhouse today and we want to make sure we’re protecting the citizens of the Carolinas. KARL: But you saw the devastation first hand, you don’t have any reason to doubt that official death toll, do you (inaudible). SCHULTZ: I’m not – I’m not calling any numbers into doubt, what I’m saying, Jon, is I was – as our team was part of it, we were very much supported and powered to get down there and try to be helpful. It’s a challenging area, the localities, you know, you go from San Juan where the major population center is out to very remote areas. We had men and women, you know, driving materials in, flying materials in, off duty when they’re supposed to be getting some rest, carrying water and things in like that. I saw what I saw and I know the fed efforts that I saw were very much committed to the – to the citizens of the commonwealth of Puerto Rico. KARL: All right, Admiral Schultz, thank you for giving this update. Talk to you again soon. KARL: And the Round Table up next takes on the politics of hurricanes, including President Trump’s response to Hurricane Maria one year later. But up next, our legal experts break down the significance of Paul Manafort’s guilty plea and his cooperation with the Mueller investigation. What could it mean for President Trump? We are back in just two minutes. PIERRE THOMAS, SENIOR JUSTICE CORRESPONDENT, ABC NEWS: He’s agreeing to cooperate and you expect that he would do so fully and thoroughly? KEVIN DOWNING, ATTORNEY: We do, thank you. KARL: That was ABC’s Pierre Thomas talking with Paul Manafort’s attorney Kevin Downing on Friday after the former Trump campaign chairman pleaded guilty to lesser charges of conspiracy in exchange for cooperating with Special Counsel Robert Mueller’s investigation. Manafort becomes the fifth and highest-ranking Trump campaign official to plead guilty to criminal charges and agree to share what he knows with investigators. Manafort's arrangement requires him to answer fully, truthfully, completely, and forthrightly questions about any and all matters and to furnish all documents and other material that may be relevant to the investigation. He also agrees to testify at any court proceeding, and waives the right to have counsel present during interviews by investigators. Joining us now to discuss what this all means, former Whitewater independent counsel Ken Starr, author of the new book "Contempt: A Memoir of the Clinton Investigation." And President Obama's ethics czar Norm Eisen, also out with a new book, "The Last Palace: Europe's Turbulent Century in Five Lives and One Legendary House. Judge Starr, let me start with you. This development surprised a lot of us. Were you surprised to see Manafort not only plead guilty but agree to this full cooperation? KEN STARR, FORMER INDEPENDENT COUNSEL, WHITEWATER INVESTIGATION: No, he was under tremendous pressure and had I been his counsel, I would say, Paul, we gave it our best shot in Alexandria. He had his opportunity before a jury and he was convicted on a number of counts. So given the seriousness of the charges that were awaiting him (ph), he did the right thing. He did the smart thing. KARL: Now you’ve been in Mueller’s shoes, trying to get agreements from witnesses. Given what Mueller offered here, a cap of 10 years for all of those charges, how significant would the proffer had to have been from Manafort? STARR: Well, there were three days of negotiations, we are led to believe. So we don’t know. But I would say this. It is very likely that Paul Manafort has indicated through his counsel and directly that he can provide very helpful information, useful information to get to the bottom of what Bob Mueller and his team have been charged to do. So it is a very significant breakthrough. Now, having said that, from my own experience as I recount in the book, you enter into an agreement with someone, Webb Hubbell. We did not think that Webb Hubbell, an echo of the past, cooperated with us. We enter into an agreement with Governor Jim Guy Tucker after his conviction. Very similarly situated to Paul Manafort. And it turned out he really didn’t have as much information as we thought he would. STARR: That’s a different -- that’s a different part of the story. STARR: But the key thing is truthfully -- you know, there were some adverbs that were used that are very important. Fully, truthfully, and so forth. Will the witness in fact -- will Paul Manafort be truly forthcoming and give more than what the typical cooperating witness gives you, which is 80 percent. Will he give 100 percent. Not make stuff up. You know, he’ll say anything that the prosecutors want him to say. No. Bob Mueller’s an ethical guy, he’s an honest guy. He will, I think, say, as we would say to our witnesses, we can deal with the truth, whatever the truth is, what we can’t deal with are lies. KARL: Norm, you’ve known Robert Mueller for decades. What is your read on what he expects to get out Paul Manafort? NORMAN EISEN, FORMER ETHICS CZAR, PRESIDENT OBAMA: Well, Jon, thanks for having me back on the show. Pleasure to be here with my friend Judge Starr. Bob is highly ethical but also among the most rigorous. I would say there is no prosecutor alive who’s more rigorous than Bob. I don’t think given the nature of the fight that Manafort put up, the seriousness of the crimes, and the power of the evidence of those crimes, Jon, that this deal would have been offered absent some very powerful evidence. And, you know, in our profession in the -- those who defend and prosecute criminal matters, you only get a deal like this if you go up the chain. Who is up the chain from Paul Manafort, who was the chair of the Trump campaign? EISEN: Don Jr., Roger Stone, the campaign itself, and perhaps ultimately the president. So I think there is a substantial -- we don’t know for sure, the judge is right, but I think there’s a substantial possibility that this evidence that Manafort is offering will implicate somebody up the chain. KARL: So, Judge, the – we’ve heard Alan Dershowitz, who has often been very positive about the president, saying that this is a huge win for Mueller, opens up a lot of doors that have not been opened in terms of the Russia investigation. At the same time, we hear a very dismissive reaction, perhaps not surprisingly, from the president’s legal team. This is meaningless, has nothing to do with the president himself. Who’s right? We don’t know. STARR: We don’t know. Understandably, it would be dismissed by the president as a nothing-burger , there’s nothing to this. But I think Alan is right that, look, Bob Mueller now has someone who’s cooperating with him. He was on the other side of the courtroom fighting every step of the way and now you have Paul Manafort saying I’m now here to help. So I’m going to honest, I’m going to be truthful, because by the way, if Manafort is not truthful, the deal is off. And it’s the prosecutor who makes the determination of whether the witness is living up to the agreement of being truthful and cooperative. So we don’t know. The way I think Bob Mueller – and I have worked with Bob Mueller – is looking at it is I now am moving toward getting to the bottom of the whole originating issue of collusion, because what Paul Manafort was doing in his representations is violations of federal law and so forth are all prior to the Trump campaign and so forth. So there’s a sort of ancient history quality to what he has plead to. But now he was of course the campaign manager, so this is a very helpful, I think, thing for the American people. I know, because (ph) the nation is so divided, but we should want the truth. Let’s get the facts out. Let’s don’t have fake news, let’s just have the truth, and I think Mueller is in a situation now to help us do that. KARL: Now Manafort had been in this joint defense agreement with the president’s legal team. How does that complicate things and does that – does that go away now? EISEN: Well the joint defense agreement does go away now. There’s no – joint defense agreements are founded on common interest, Jon. So the interests have diverged. What doesn’t go away is privileged information that was shared by the president or by his lawyers with Manafort and his lawyers originating from Trump during the pendency of that agreement. It’s the same as if President Trump had provided that attorney client privilege information to his own lawyers. That’s protected, so Manafort can’t say well here’s what I heard the president says about the Trump Tower meeting. But Manafort can speak fully and completely, and the reason I believe is a wrote in the Times the other day the reason that I believe that this is the pivotal turning point is – and the judge knows this full well from his investigation, which secured 14 convictions, Manafort is a Sherpa (ph) for the key moments. He is somebody who – who can come to court and explain for the first time we have somebody who was at the infamous Trump Tower meeting. We have his notes, he can explain his notes, he can talk about the run up to the meeting, the afterwards. KARL: And how significant is it that this agreement says that he will talk to investigators, answer their questions without his attorney present? STARR: Well I think it’s enormously, again, helpful to doing what? Let’s get to the truth of the matter. You – I – it’s hard to overestimate the sense that prosecutors have – we want to get to the bottom of these issues so we have all the facts and we can assess those facts. And so it’s all the more helpful that Paul Manafort has said you – you have me and I’m going to give you the truth and nothing but the truth. So I think this is – this is really good for the country. KARL: What happens if the president pardons Manafort at this point? KARL: Well a pardon doesn’t -- doesn’t stop it. EISEN: The pardon will only -- in my view will only hurt Trump. It will only dig his -- his -- the hole deeper. But I think this -- this week is going to be looked back on as a historic turning point. KARL: OK, we’re just about out of time. Quick predictions from both of you. How much longer does this go on? Is this an indication that the Mueller investigation is really just beginning or is -- is wrapping up? STARR: Depends on what Paul Manafort has to say. What is he pointing folks to, and it may very well be that some of the things he’s going to point -- maybe -- Bob Mueller to will be handed off to others in the Justice Department. In other words, Bob Mueller may say I’ve done my job, here it is, here’s my report to the deputy attorney general. KARL: When do you think this ends? EISEN: You know, having just completed the history of Democratic inflection points over the past 100 years, Jon, as seen through the windows of that house that the judge -- I was pleased to welcome the judge and his wife Alice to see me there. This is the -- I believe not the beginning of the end, but the end of the beginning for Donald Trump. We have seen a new chapter. He's not going to survive Manafort's testimony. KARL: Very Churchillian of you judge, Norm, thank you for joining us. We'll be back in just two minutes with the Powerhouse Roundtable and their analysis of the political fallout of the Manafort deal. What does it mean that Trump's approval ratings are down and Mueller's are up? KARL: Back now with the Roundtable. Chris Christie, now an ABC News contributor, Democratic strategist and former DNC chair Donna Brazile, Jonathan Swan the national political reporter for Axios, and Tamara Keith NPR White House correspondent and co-host of the NPR politics podcast. Governor, did this plea deal for Manafort and the extent of his cooperation surprise you? CHRIS CHRISTIE, FORMER GOVERNOR OF NEW JERSEY: No, because he was facing the rest of his life in jail. And my experience as a prosecutor tells me that when someone is facing significant time in jail, their willingness to stay firm becomes much less so. And I think we don't know the significance this is going to be, ultimately, Jon, only Bob Mueller does. And I've said right from the beginning of this, one of the things that's made Mueller a very serious and dangerous prosecutor is that he has not let his operation leak. And so we don't know what -- is Paul Manafort cooperating against lobbyists who were engaged in the Ukraine situation with him? Possibility. He is cooperating against other people in the Trump campaign and what went on there? It could be both. It could be either. We don't know. And Bob Mueller won't let us know until he issues a charging document, I suspect. DONNA BRAZILE, DEMOCRATIC STRATEGIST: But he pleaded guilty to conspiracy against the United States of America. And I know that may have broad implications. I'm no lawyer, that's why I'm sitting next to you. But the fact is, is that Paul Manafort at one point said he would not flip. He's flipped. He's cooperating. And if he fails to cooperate and give the prosecutor what he wants, then we know that those counts that perhaps he wasn't charged in Virginia may come back again. So, Bob Mueller now can finally get to the bottom of this whole case. And I hope that we find out the real truth so that we can prevent the kind of meddling we saw in 2016. CHRISTIE: Well, the judge was right, by the way in Virginia. Remember, the judge said the only reason that these charges were brought would be to squeeze Mueller to get him to flip. Guess what, mission accomplished. KARL: Well, so how worried are they actually about it (ph)? KARL: You do a pretty good job of reading the body language on this (ph). SWAN: This stuff -- this stuff they’re pretty -- this stuff they’re pretty buttoned down on. Like something that really gets the core of it. But on the -- on the Manafort situation, it is actually a substantive story. We -- we hear every week there’s so much noise about Mueller. This one actually matters because he really was there at the center of it. If anyone actually had the capacity to collude and have high level contacts with Putin’s inner circle, Paul Manafort’s pretty well-positioned given his history with oligarchs. SWAN: -- Don Jr. and Jared. KARL: And the only thing we’ve heard from the president on this is more talk over the witch hunt. TAMARA KEITH, WHITE HOUSE CORRESPONDENT, NATIONAL PUBLIC RADIO: Exactly. Which is not a surprising thing that he would go back to the witch hunt trope. I mean, the -- as the governor said, it’s fascinating that -- that Robert Mueller has been silent. You don’t hear from him at all and the only person making noise is the president of the United States. He’s the one who keeps talking about the investigation. And -- and yet Mueller’s ratings are up. KARL: Right. Well let’s -- let’s go back to what the president tweeted about Mueller just a month ago. He said, I feel very badly for Paul Manafort and his wonderful family. Justice took a 12 year old tax case among other things, applied tremendous pressure on him and unlike Michael Cohen, he refused to break, make up stories in order to get a deal. Such respect for a brave man. So Governor Christie, you know the president better than any of us. Why did he not pardon Paul Manafort before this happened? CHRISTIE: Because it was politically impossible to do so. KARL: But he wanted to, didn’t he? CHRISTIE: Well I don’t know if he wanted to or not. He didn’t tell me he wanted to, but I would just tell you it was politically impossible to do so and the president is not a stupid politician. And he knows that that would have cost him congressional support for sure on the Republican side of the aisle. Because anything that looks like you’re trying to impede the -- the Mueller investigation anyway is kind of a red line, I think, for a lot of Republicans, not only in the House but much more importantly, in the United States Senate. KARL: Is it accurate today? KARL: He’s (ph) a brave man? CHRISTIE: Well, he may be a brave man who putting his family first. CHRISTIE: Well I haven’t spoken to the president so I can’t speak for the president on this, but I would tell you is that, you know, Manafort now has decided that he’s putting his family first. And we heard that from Michael Cohen as well when he did what he did. But what the president wrote in the beginning of that tweet’s important to focus on too. Because it is exactly what Bob Mueller did. He took a 12 year old tax case that had been passed on by the Justice Department before and he used it to squeeze Paul Manafort to get him to cooperate and he succeeded. Now, some people find that kind of operation by the Justice Department really, really distasteful. CHRISTIE: But -- no, listen, what I did as a -- as a prosecutor was to get whatever I needed to do to get to the truth. Here’s what -- the -- the key moment in this entire thing was when Rod Rosenstein appointed Bob Mueller. There are lots of other people he could’ve appointed. Lots of other really credible prosecutors that he could’ve appointed. You know what Bob Mueller’s reputation was (ph) inside the Justice Department? I was there when he was the head of the FBI. He’s a killer. KARL: So -- so -- but Jon, Sean Hannity came out to speak on his radio show and he said that Trump is likely to fire Mueller soon, perhaps as soon as the hurricane passes. Does Sean Hannity know what he’s talking about? SWAN: Well he certainly has the access to the president to be able to make such comments, but I haven’t -- you know, Trump likes to put this stuff out there as sort of like -- he throws it out there like chum. But I don’t think he’s actually serious, because he has -- he has contact with people in the Senate, he knows how they feel about this. That is a red line that would cause a revolt in the Senate and it would put him -- I mean, that’s the path to impeachment. KARL: I want to switch to -- to the -- to Hurricane Maria and this dustup that the president brought on himself. He’s -- you know, questioning the death toll. What’s fascinating to me, Tamara, is that we have not heard from the president -- we haven’t even actually seen him in public since he first came out and -- and -- and questioned the death toll. The White House -- I mean, what’s going on here? KEITH: The president is doing the typical sort of Trumpian cycle here he – he says something that has to be fact checked, it gets fact checked, then he fights back, he digs in, and that’s where we are right now. He’s completely dug in on – on the number with the death toll. And – and everyone around him seems to be saying hey, there are – there are other things to focus on like the current hurricane that is – that is still going on, though a tropical depression. SWAN: There’s a few things about Trump that just can’t be emphasized enough and governor would know this, he’s obsessed with numbers. It’s the – he always needs a scorecard for everything he does, whether it’s a poll or whatever it is. And the other thing, we talk about – about his obsession with Obama, he’s also actually pretty fixated on George W. Bush. And one thing that he was talking about last year privately during the hurricanes was Bush and Katrina. And so that is something that’s on his mind and he watches the coverage and it’s always a review about him. He sees everything through the prism of Donald Trump and it’s just – it’s impossible for him to separate himself from – from the story. BRAZILLE: Well you know, 2,975 people, Puerto Ricans are still mourning their dead. The most important period after a storm passes is the response. You know this, Governor, you were there firsthand. People need medical attention, they need prescription drugs, they need food, water, and I’m not surprised that the death toll went up because you cannot find the dead until you actually go and look for them. That happened with Katrina, they went door to door. And so for the president of the United States not to show one ounce of empathy for those who are still mourning the loss, I mean I – I can’t even speak of the horrors of what it’s like to go through a hurricane, let alone when you’re looking for your family only to find out that they didn’t make it. And the president is not even worried about that. What’s happening right now in North Carolina and South Carolina is some people will not make it. They will not survive this storm. That water is going to come from nowhere and they won’t make it. They can’t outrun it. And so that’s what he should be focused on, not on his poll numbers, not on the studies, this is an independent investigation. And – and George Washington University concluded there were 1,600 people during that period that passed away. But they found 2,975 died as a result of that storm. The president should respect that and respect the mourning of others. BRAZILLE: I still pray for this president every day of my life that he can just feel what we all feel as Americans and – and stop being this president that nobody understands. KARL: But why is he politicizing this? I mean I remember so vividly you side by side with Barack Obama in the response to super storm Sandy. CHRISTIE: Well listen, there’s lots of lessons to be learned from that, OK, positive and negative. I did what I thought was absolutely right and necessary as the leader of the people of my state, which I didn’t think was extraordinary at all. KARL: A lot of Republicans didn’t like it, by the way. CHRISTIE: Well that’s the – that’s the negative side. Let me tell you something, when I ran for president of the United States and I was in Iowa and New Hampshire, I heard more about this fictitious Obama hug than I heard about any other issue regarding my tenure as governor. So it’s a mixed political message, but my point is you’ve got to get rid of the politics on this stuff, because what your job is is to protect the people who are in danger. And Donna is right about this, it’s going to get worse, not better in North Carolina and South Carolina because keeping people safe during the storm is the easier part. Get them to evacuate, open shelters, get them fed and clothed and hydrated. It’s what happens when the water starts to recede, all the damages there and where are they going? Many of – listen, in New Jersey, 365,000 homes were destroyed in 24 hours by Sandy. Where do you – what do you do with those people after that? How quickly can you rebuild? Roy Cooper and Henry McMaster have a big task ahead of them and they’re going to need Donald Trump in order to get it done. I needed Barack Obama in terms of getting it done and I was not shy at all about asking the president for help and treating him well when he deserved it. KARL: All right, we’ve got to take a quick break, we will be back with more Round Table in just a moment. Looking ahead to the mid terms and what could be – could a blue wave be heading not just towards the House but also the Senate. Plus our exclusive interview with the Wall Street titan who says he is, quote, "smarter than President Trump". He later backtracked but does Jamie Dimon have an eye on 2020? We’ll ask him. KARL: The Roundtable will dive into the stakes for the midterms just 51 days away when we come back. And a reminder that you can get the latest on politics with breaking news alerts on the ABC News app. KARL: And now to our exclusive interview with CEO Jamie Dimon, the head of JP Morgan Chase. He is one of the last remaining bank CEOs who worked through the 2008 financial crisis, which began with the collapse of Lehman Brothers 10 years ago this weekend. Now, a decade later, could a Wall Street executive like Dimon be the next businessman to make a run for the White House? Our Rebecca Jarvis caught up with him this week in New York. REBECCA JARVIS, ABC NEWS: Why not throw your hat in the ring, Jamie? JAMIE DIMON, JP MORGAN CHASE CHAIRMAN AND CEO: I said this before Trump was elected, and you're not going to get a wealthy New Yorker elected President. Boy, I was dead wrong. And by the way, this wealthy New Yorker actually earned his money. It wasn't a-- it wasn’t a gift from daddy. JARVIS (voiceover): JP Morgan CEO Jamie Dimon taking aim at the president, saying he could beat Donald Trump in a potential 2020 match-up. DIMON: I'm as tough as he is. I'm smarter than he is. I-- I would be fine. He could punch me all he wants, it wouldn't work for me, I'd fight right back. JARVIS (voiceover): But immediately after, in our exclusive interview, Dimon backpedalled. DIMON: Yeah, I shouldn't have said it. And I -- more out of frustration and a little of my own machismo, but I shouldn't have said it. And so -- it also proves I wouldn't be a good politician. JARVIS (voiceover): President Trump seemed to agree, firing back on Twitter the next morning, "the problem with banker Jamie Dimon running for President is that he doesn't have the aptitude or ‘smarts’ and is a poor public speaker and nervous mess -- otherwise he is wonderful." Dimon, who once served on the president's now disbanded strategy and policy forum, says a run for the White House is out of the picture, for now. JARVIS: So you're, you're done with politics? JARVIS: No running for president for you. DIMON: Well, I never say never to anything but no. JARVIS (voiceover): But the Wall Street titan is wading into public policy: from immigration to health care and yes, Donald Trump. JARVIS: Unemployment below 4 percent. The market is at record highs and consumer confidence is booming. How much credit does the president deserve? DIMON: You know, when President Trump was elected confidence skyrocketed, consumers, small business, large corporate and because pro-business, pro-competitive taxes, pro some regulatory reform, and that has helped the economy. So it's impossible for me to tease out how much but it has helped the economy, just like that President Obama helped to stop the economy from getting much worse. But they also did policies, I think, that slowed down growth. So, some of those are being reversed. So, yeah, he should take some credit for that. JARVIS: What kind of grade would you give President Trump purely on the economy? DIMON: I'd say pretty good. JARVIS: B plus? A minus? DIMON: Yeah, something like that. JARVIS (voiceover): Dimon is optimistic about the current economy, but 10 years ago it was a very different story. CHARLES GIBSON, ABC WORLD NEWS TONIGHT ANCHOR: Financial institutions are in trouble. 158-year old Lehman Brothers filed for bankruptcy. Stock giant Merrill Lynch was sold after just two days of discussions. It is all a bit dizzying. JARVIS: Are we in a place where the banking system will never see something like that happen again in the United States? DIMON: I think it's a mistake to say the banking system. The banking system is very, very, very healthy. And regulators should actually take a little bit of a victory lap, because Lehman would not happen today. But there will be a recession one day, but it won't be the banking system. It'll probably be something else. JARVIS: Banks got a considerable amount of the help. Do you think they've done enough post crisis, to help rebuild this economy? DIMON: So I think your question is -- is a unfair. All the banks -- banks got help. I mean I think the government did the right thing, I want to give full credit and TARP was part of that. But not all the banks needed that. And all those banks, including JP Morgan, continued to lend money every day to all their clients nonstop around the world. They also-- some caused the problem, and I understand that the American public looks at it and it's unfair and it was. OK? They look at it like the -- the elite Washington banks, a bunch of -- kind of -- kind of got bailed out and they suffered, and there's some truth to that. And they didn't see Old Testament justice. So I understand why there’s a lot of anger out there. JARVIS: How would you in your role resolve that anger? DIMON: I can't. There's nothing I can do. All I can do is serve my clients everywhere around the world, do good things, try to earn our respect every day with our clients and communities. That's the best I can do. JARVIS (voiceover): And this week, JP Morgan pledged to invest 500 million dollars in communities over the next five years through its "Advancing Cities" initiative. DIMON: We know that working with government, working with civic society, working with business, how can you lift up affordable housing, jobs, education, entrepreneurs of color and all of these things can make these cities better? KARL: Thanks to Rebecca. We’re back with the roundtable. We’ll talk 20/20 in a moment. But let’s start with an election that as of tomorrow is just 50 days away. Democrats have been favored for some time to win control of the House, but there are now indication that the Senate is very much in play. Our colleagues at FiveThirtyEight say Democrats have a one in three chance of taking over the Senate. So Donna, you are familiar with how difficult this map is, this Senate map for Democrats. Does that sound right to you, about a one in three chance of winning the Senate? BRAZILE: Absolutely. Look, at the beginning of this cycle, we -- we thought that the Republicans would take 60 seats in the Senate. But Democrats are doing well in -- in states that Donald Trump won in 2016, Joe Manchin is doing very well, Claire McCaskill is doing very will in the great state of Missouri. And you know what? Senator Nelson, despite the fact that Rick Scott is spending a lot of money down in Florida, he’s doing very well. Doing well in the Midwest and I think Democrats have a opportunity to pick up Nevada and Arizona. So yes, we -- we’re confident. Not overconfident, but confident that we can run the tables in the Senate. KARL: Governor, Mick Mulvaney said that -- that Republicans could actually even lose in Texas. He said of the Ted Cruz, Beto O’Rourke race, sometimes the likeability of a candidate matters. KARL: Could Ted Cruz lose? CHRISTIE: No. Ted Cruz is not going to lose. And -- and by the way, I don’t think you’re going to see Joe Donnelly win in Indiana and I don’t think you’re going to see Claire McCaskill win in Missouri. I mean, Heidi Heitkamp’s still running for her life. So, you know, listen, I love Donna but, you know, she’s not betting any money. I know Donna. She’s not betting any money on the fact that the Democrats are going to win the Senate. The Republicans are going to win the Senate and they’re probably going to add a few seats to that majority. Maybe they get to 53 or 54. They’re not going to lose with Martha McSally in Arizona. And -- and -- and Joe Manchin is a unique candidate in West Virginia. He served as the governor for two terms and people get to know their governors and -- and -- and really have an investment in them. So I think that when you look at the Senate -- that one in three thing, remember, FiveThirtyEight was also saying, you know, President Hillary Clinton. So I’m not going to rely on them too much. KARL: But -- but Mitch McConnell sounded the alarm. Maybe he was just playing the expectations game or are they really worried? My sense is that Republicans are actually worried. KARL: -- but my sense is that Republicans are worried about the Senate. SWAN: No, they -- they are worried. And -- and this all just comes back to the height of this wave, right? I mean, it would take a tidal wave to wipe out the Senate. I mean, this is the best map since the 1930s, so if they lose the Senate, you know, forget it. It’s -- it’s a -- it’s a wipeout. So they’re worried but Mitch McConnell has to raise money. So he’s, you know, always beaten that drum. So you have to pass it now (ph). KEITH: -- unbelievable. But that is an indication that -- that there is concern. And -- and frankly, Ted Cruz isn’t the only person on the ballot in Texas. There are -- there are some House candidates who have a lot more trouble than Ted Cruz does. And -- and so having the president go could generate excitement. SWAN: If you’re trying to jack up turnout, you don’t say red wave, you say blue wave. KARL: So -- so we heard something interesting from Kevin McCarthy. Kevin McCarthy is saying that Republican -- Republicans can keep the House if the president’s approval rating is above 43 percent. 43 percent. And our poll right now, Donna, the president’s approval rating is at 36 percent. BRAZILE: This is a referendum not just on President Trump and his performance in office, Democrats want to restore some checks and balances. But you know what, the president has given us issues every day, whether it’s prescription drugs, saving people with preexisting conditions from losing their health insurance. There’s a lot of energy in the Democratic field, but there are independents who are coming our way and that’s why I do believe in Indiana, Missouri and all those other states. We have a great chance. KARL: OK, we only – we only have a minute left, I want to get to something that Axios has put out about the 2020 race, saying that the Democratic candidates fall into two categories, the ruthless radicals that want to go more Trump than Trump in terms of the attacks and the responsible restorationists. SWAN: The point of that piece is that the biggest divide in the Democratic Party for 2020, I think, and Donna may disagree with me, is not actually going to be over policy. I think Democrats are going to basically agree on Medicare for all, $15 minimum wage, you’ll get papered (ph) over all those differences. The real difference is how, as one Republican – a Democrat (inaudible) said how crazy will Trump make us? So you have Avenatti saying we need 11 seats on the Supreme Court so we can pack it with Democrats. KARL: Donna – Donna, very quickly, are you with the ruthless radicals or are you with the responsible restorationists? CHRISTIE: Can’t wait to hear this. KARL: We’ll be right back. KARL: (In progress) -- for us today, thank you for sharing part of your Sunday with us. Check out "World News Tonight" for the latest on Florence and have a great day.